RNA chains are composed of simpler units called nucleotides. Four different bases are used in RNA; adenine is shown. sugar, a nitrogen-containing base, and phosphate. 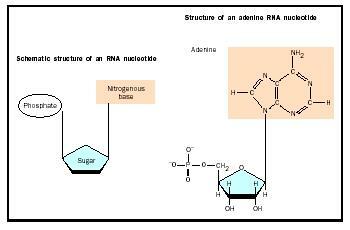 The pentose sugar found in RNA nucleotides is ribose, whereas that in DNA is 2 (2-prime) deoxyribose. The bases commonly found in RNA nucleotides are adenine (A), guanine (G), cytosine (C), and uracil (U). Bases found in DNA are A, G, C, and thymine (T instead of U). As in DNA, the individual nucleotides in the polymer are joined together by phosphodiester bonds. Unlike DNA, RNA is single-stranded; however, many RNA molecules fold into complex three-dimensional structures. During transcription the DNA code is read and copied into RNA. The sequence of nucleotides in an RNA is therefore determined by the sequence of nucleotides in the gene from which it was transcribed. Following transcription, RNA may be processed before it becomes functional. There are three main classes of RNA: messenger RNA (mRNA), transfer RNA (tRNA), and ribosomal RNA (rRNA). Each of the classes is important in some aspect of protein synthesis. The nucleotide sequence of a messenger RNA specifies the order of amino acids in the protein which it encodes. A cell contains many different mRNA molecules, each being the blueprint for a different protein. Although mRNAs are the least abundant class of RNA, they are the most heterogeneous . Ribosomes play an important role in protein synthesis, and ribosomal RNA (rRNA), is an important structural component of ribosomes. rRNA is the most abundant type of RNA. tRNAs act as adaptors in protein synthesis, in that they read the sequence of nucleotides in the mRNA and deliver the correct amino acid to the growing polypeptide chain. Most scientists believe that life has evolved from what was essentially an "RNA world." In today's world, most organisms store their genetic information in DNA and use proteins (encoded by DNA) to catalyze biologically important chemical reactions. RNA molecules, however, are believed to have been the first biological catalysts. Through evolution, some of these RNA molecules gained the ability to replicate themselves, and through many rounds of replication, the RNA molecules gained new capabilities, such as the ability to code for and synthesize proteins. Eventually, the RNA genome was replaced with DNA. Scientists have uncovered a number of enzymatic RNA molecules, called ribozymes, believed to be typical of those in the RNA world. RNA enzymes can make phosphodiester bonds, suggesting that early RNA molecules could reproduce their genetic material. In fact, it is now known that RNA in the ribosome catalyzes the formation of peptide bonds during protein synthesis, supporting the idea that RNA molecules were able to synthesize proteins. Even in the twenty-first century, not all genomes are composed of DNA: some very important viruses, such as the one that causes AIDS (acquired immunodeficiency syndrome), has RNA as its genetic material. However, the so-called RNA viruses express their genome only after they have turned it into DNA. The article and the information therein is very explicit. There is alot of elaboration and gradual process in explanation which makes the topics more interesting as compared to most in biology text books or prof handouts.